Traveller: Travel News and Stories: Learn how Experts Camp in Winter - and Have Fun! Learn how Experts Camp in Winter - and Have Fun! From elevating the humble Winter beanie to debunking myths about how to stay warm in a sleeping bag; more than 60 managers from 36 holiday parks from coastal and country NSW have pulled together their collective knowledge to ensure families have a fun Winter caravanning or camping adventure. The tips, which range from sensible clothing advice to fun ways to keep warm like snuggling your loved ones around a camp fire come from the NSW Crown Holiday Parks Trust (NSWCHPT) Group which manages 36 holiday parks across NSW and encompass North Coast Holiday Parks (NCHP), South Coast Holiday Parks (SCHP) and Inland Waters Holiday Parks (IWHP). 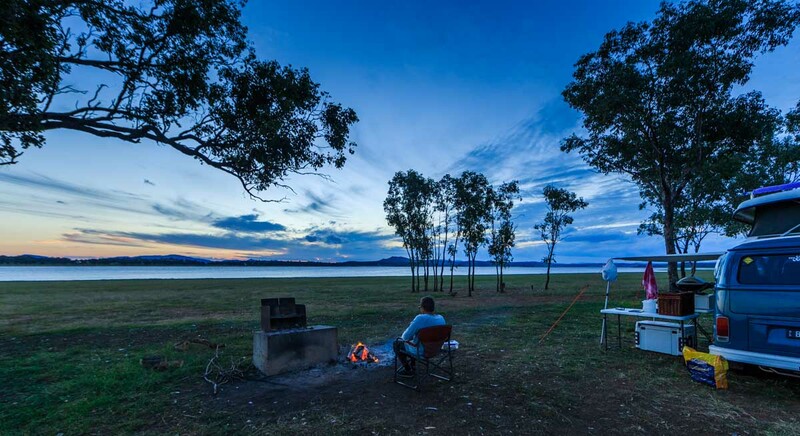 NSWCHPT CEO Steve Edmonds said park teams and the collective knowledge of the Group represented decades of camping experience in all kinds of weather so families could rest assured that the best advice was on hand to help families and campers have a great holiday. "The biggest myth of all is that people won't have a good time if they go camping in the colder months when in fact this time of year is one of the best times for outdoor activities at our parks like fishing, surfing and hiking," Mr Edmonds said. The humble beanie is a good move as it prevents lots of heat loss. The Ugg Boot, (or equivalent), should be on any serious Glamper's winter check list! Thermals are also an option if you're too far away from a warm house! Select a good quality sleeping bag. There are some very good ones on the market now. Why not prepare some yummy stews, soups and hearty foods prior to arriving; they will certainly keep you fuelled with warmth and energised to play! Make sure you air your tent daily to prevent condensation build up which makes the inside damp and uncomfortable. When the ground is cold; use foam floor tiles on the tent floor to give an extra layer of insulation. Don't camp in a valley or watercourse and position your tent to take full advantage of the warming morning sun. Wear a beanie to bed and keep your head out of your sleeping bag as a night of breathing may cause your sleeping bag to become damp. Put glow sticks in water bottles for a game of night time bowling or place them around a tent's guy ropes to prevent trip hazards. Mr Edmonds said each park also shared their top tips on keeping warm in a tent this Winter, with the consensus being to make sure plenty of thermals and woollen socks were packed, water bottles were not forgotten and hot thermoses of hot chocolate were on hand. "My best tip is to prepare and plan ahead for the expected weather and don't forget to have fun", Mr Edmonds said. "Many of our parks also have communal camp kitchens which are perfect for those wet days and allow guests to enjoy flat screen TVs and electric cooking facilities like bbqs toasters, jugs, microwaves and fridges. "I am also a big fan of sitting around a camp fire and enjoying the amazing locations our parks are situated in; just don't forget to check which parks allow fires beforehand." Mr Edmonds said there was still plenty of availability across the parks for the Winter School Holidays, and encouraged anyone thinking of a last-minute trip to book now before sites disappear. For more information about the coastal and inland holiday parks managed by the Trust and to plan your next caravanning and camping adventure visit www.northcoastholidayparks.com.au, www.southcoastparks.com.au or www.inlandwaters.com.au.